How to Pass Data from One Component to Another Component without Navigating to the Other Page. it can be blank or tabs project your wish.. next, create a Component with name "changes" as follows. next, add "ChangesPage" to NgModule's declarations as well as bootstrap's entryComponents. after modifying, app.module.ts will look something like this. Now open changes.html file in changes foder. Open changes.ts file and paste the below ts code. Since our work in changes Component is over lets head over to home page. open home.html and replace the html with below html code. run the project now, you can see that the record you entered in the input will be updates in other component. "this.events.publish" is used to publish, so i've used "userObj" as publish name and send the data object "obj" when new record is entered when addObject() method is called. since we have published the event all is left is to subscibe to the event where we want the changes to take place. 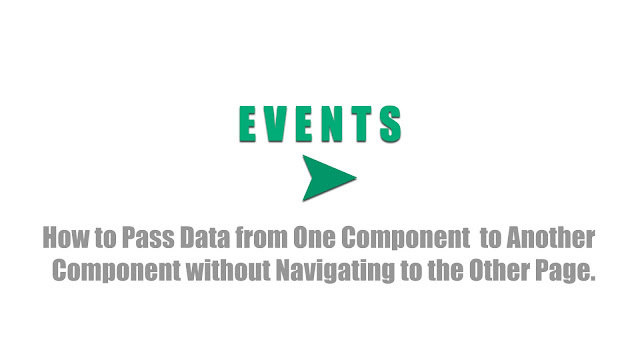 so in this example i've subscribed to event in ChangesPage component to push the record in list object. "this.events.subscribe" is used to subscribe to an event.